More info to come on cycling/4WDing the Dunstan Trail but here’s a bit to get you started. It’s a great ride from Alex to Moa Creek over the Crawford Hills rd. – they have accomm and can return you the next day… ph 03 444 7865. Otago Tours can drop you off/pick you up from either end. Ph. 03 4488824. The sections of the road crossing over Rock & Pillar Range and South Rough Ridge are normally closed in winter – first Tuesday in June to 30 September. The Dunstan Goldrush began in 1862 when two Americans, Hartley and Reilly, discovered a rich gold claim on the banks of the Molyneux (Clutha) River, just up-river from the present township of Clyde. Miners set out inland from Dunedin, Gabriel’s Gully and other parts of Otago intent on finding their share of gold in the new field. The Dunstan Road was the preferred route for those in a hurry. It followed an almost direct line from Dunedin to the Dunstan – a distance of 175km, crossing four major mountain ranges – Lammermoor, Rock and Pillar, Rough Ridge and Raggedy Ranges. A small settlement sprang up at Outram where travellers were ferried across the Taieri River. Later, a bridge and toll house were built but all were swept away in the flood of 1863, and the present town of Outram was built on higher ground. From Outram, the original Dunstan Road spread out as each traveller chose his own way up the leading spurs, the trail narrowing again where it was confined to cuttings. Little remains of the accommodation houses, stables and grog shops that once lined the route – there were about ten licensed premises recorded and probably as many unlicensed ones along the way. Only the remains of the Lee Stream Hotel and Oasis Hotel at Deep Creek still exist. At Lee Stream, the old hotel is now in private ownership. The remains of the Oasis Hotel is near Rocklands Station right next to where the trail becomes a gravel road climbing over the Lammermoors. Near what was the Great Moss Swamp and is now the Loganburn Reservoir is Howell’s Hut, where there was once a sly grog shop. At McPhee’s Rock there was a halfway house run by Mother McPhee. 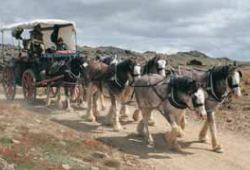 It took horse-drawn drays two or three weeks to complete the round trip from Dunedin to Dunstan and back, carrying supplies of food, timber and other provisions. Bullock wagons could take even longer. Wagoners often made more money than the miners they were supplying. The first Cobb & Co. coach left the Provincial Hotel in Dunedin’s Stafford Street, for the Dunstan, in November 1862 – a journey of three days each way. The time was soon reduced to one day’s travelling (from 4 am until midnight) by the establishment of stables and relays of horses. As high winds often threatened to capsize the vehicles, the tops of the coaches were removed and passengers were quite pleased to get out and walk for warmth as well as to make it easier for the horses. There was usually an overnight stop at Styx. The “jail” was in fact a lock-up where the gold bullion was protected. The chains which were used to padlock the gold chest in safety are still in place. Just beyond Styx, the trail headed across country to the old Blackball Hotel. This part of the trail is on private land, but trail users can go north to the Paerau Junction and then turn west again to Linnburn Station. From Linnburn, the main trail leads over Rough Ridge to the Poolburn Reservoir and then down to Moa Creek where there is an old pub on the corner. The trail is on metalled roads from here on across the Raggedy Range and the Manuherikia River and via the sealed back road to Dunstan (Clyde). The route was abandoned for coaches in 1864 when they changed to the more sheltered way through the Pigroot, but wagons continued to travel over the Dunstan Road for many more years. It is now gaining in popularity with mountain bikers and 4WD vehicle owners. Please note: The Dunstan Trail is closed each year from the first Tuesday in June until the end of September.